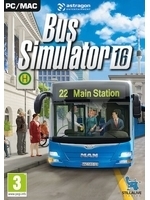 Bus Simulator 16, released yesterday on Steam, is a management and simulation game putting you at the head of a bus company in which you have to manage your lines, buses and drivers. Here are some videos. Looks fun :D But why is the ramp button outside instead of the dashboard? We're going to rent a bus to go to Cologne this year and Miguel will do all the driving. Beware pedestrians. That was stressing me out. Then, I can highly recommend You a Desert Bus game for Sega CD. :-D But this game looks nice. Nice, the buses here have button for the passengers so they can push it themself. Looks good and how is the penalty system - What happens if you hit other cars, go above speed limit or run red lights and things like that? If you go above speed limit too high and run on red lights you get fines and passengers don't like it so you'll end up with less than five stars. If you hit cars, signs or walls you have to pay for repairs and passengers don't like it as well. If you like simulation-style games, will you put up any videos of American Truck Simulator? I tried creating new profiles, OpenGL, DX, windowed, GSync off, nothing, the game always freezes everytime I click "Continue" and I have to kill the process. Yay, thanks for all the troubleshooting, you are a true Gamersyde hero!